Book Reviews: 'A History Of Future Cities,' 'The Metropolitan Revolution,' 'Smart Cities,' 'Rewire' Millions of people worldwide are leaving rural areas for urban ones. 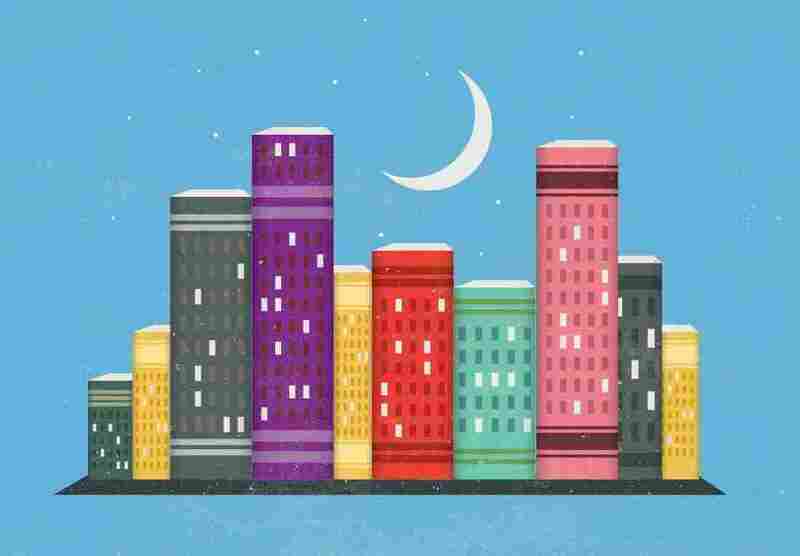 NPR Cities Project editor Franklyn Cater highlights five books that examine and celebrate 21st century life in the metropolis. At the NPR Cities Project, we've spent much of the summer reading, breathing, reporting on urban innovation. From smartphone apps such as NextBus and StreetBump, to citywide surveillance camera networks, to 911 texting and NASA-style command and control centers for city agencies, we've been exploring how cities are using technology in the 21st century. It's a hot topic among urbanists everywhere. There is no doubt that information technology is changing how we get around, how our governments work, and how we relate to the people in our neighborhoods. By 2050, the United Nations projects, almost 70 percent of people around the world will live in metropolitan areas. So lots of technologists are looking for solutions to urban puzzles with the hope that bigger, denser population centers of the future can also be more efficient and more pleasant places to live. With these trends in mind, here is some of the year's big thinking about the intersection of our increasingly digitized and citified lives. In some parts of the world — especially in developing countries — the trend toward urban living is so rapid that villages are turning into major metropolises in a matter of years. But it's not a new development. Daniel Brook takes us back in history to explore four huge, well-established cities and how they once experienced their own population explosions: St. Petersburg, Shanghai, Mumbai and Dubai. In the 18th century, Peter the Great, captivated by the city of Amsterdam, decided to mimic the Dutch. He emulated their shipbuilding. He imported the printing press. But when he built a new city, St. Petersburg, as a copy of much of what he saw in Holland, he ordered it built by unpaid serfs. He did not offer them so much as a wheelbarrow in the way of technology to assist. He later boasted that 100,000 people had died in the city's construction. That theme of modernity for the privileged continued in the late 19th century. In Shanghai, American steamship technology helped to fuel the economy. The telegraph and electricity defined Shanghai as a modern city unlike the rest of China, but the modern life was for the elite and for foreign visitors only. Brook points out that these are Eastern cities that westernized as they modernized. "Can," Brook wonders, "modernization and globalization ... ever be more than just euphemisms for Westernization[?]" Fast-forward now to the present day U.S. Bruce Katz and Jennifer Bradley of the Brookings Institution argue that with the federal government bitterly divided and dysfunctional, power is shifting to cities. The book describes specific metro areas as tales of success, starting with the nation's largest city. Before the recession, New York had become too dependent on the financial industry. Now, the city's focus on the fields of science and technology is adding needed economic diversity. And as New York brings in new industries, those industries are bringing a little bit of New York to other cities. Katz and Bradley highlight the concept of "innovation districts": clusters of universities, hospitals, museums and "cutting-edge innovative firms" along with other companies, all together in the same area with housing, retail and transit. That may sound like a pretty basic description of a city. But for decades, much of America has not been built that way. Now, development is changing again. Gone are the days of the suburban research park, Katz and Bradley say. Katz and Bradley notably cite the midtown and downtown areas of Detroit as "the most intriguing" spot where this kind of development is recharging a city. Detroit is, of course, destitute. It declared bankruptcy this month. But, these authors argue, this particular slice of the Motor City, "as counterintuitive as it may seem," serves as a model for other places. This book's first chapter is titled "The $100 Billion Jackpot." It's how Anthony Townsend describes the booming worldwide business of constructing data networks to function as the nervous systems of 21st century cities. At the fore are global tech corporations — IBM, Siemens and Cisco, to name a few. This is "the twenty-first century's first new industry," Townsend writes. With powerful, readable prose, Townsend points to Songdo — a new Korean model city being built from scratch — as an attempt to define what a smart city can be; a place where roads, power grids, security, water, sanitation are all networked and run by computer. The idea is that everything will be more efficient, and thereby more eco-friendly. "Data centers chock-full of CPUs scan millions upon millions of sensor readings, looking for larger patterns. As this big data accumulates over time, the city's managers will begin to understand its daily rhythms and program new rules about how to direct traffic and power." But while Townsend is not dismissive of the potential of the smart city, he is wary. Big companies — IBM — for instance — are "wanting" in their own understanding of how cities work, he suggests. And in a chapter entitled "Cities of Tomorrow," he reminds readers of the potential for unintended consequences, by recalling another technological revolution in cities: the automobile. A 20th century vision of escaping urban troubles — and the so-called Garden City — "metamorphosed into ... suburban sprawl." Townsend says if care is not taken, similar unforeseen snags could await "smart cities" in the decades to come. Ethan Zuckerman's book Rewire is about both urban space and cyberspace. It's an impassioned call to what he calls a "digital cosmopolitanism," in which we all encounter and pay attention to things beyond our own circles and areas of interest online. While the Internet and social media offer more opportunities than ever to be connected, he says, in reality, the websites we peruse and the people in our networks mostly reflect our own interests and values. Instead, Zuckerman wants online spaces to be like the best cities — spaces that help people linger and mix. In the course of his argument, Zuckerman uses the city as a metaphor for the Internet, but he also calls out the city's power as a kind of communications technology in and of itself, encouraging interaction between people. He cites a wide range of potential upsides to living outside of our digital comfort zones — some more pressing than others. Artists might find unexpected inspiration, as Picasso did in African masks. Corporations may find a brilliant CEO on the other side of the earth. Health officials might react quickly to stop the global spread of a deadly disease, such as SARS. Governments might better recognize and contextualize inflammatory speech that could fan unrest or terrorism. Zuckerman advocates "strolling" through cyberspace and seeking serendipity. A good reminder of how to explore a city, too. The idea that humanity's future is an urban one is becoming a common theme. So is the idea that as the population grows and the climate changes, the best hope we have for a livable future is to design our cities well. Leo Hollis is not breaking new ground so much as reporting on the talk among many mayors, city planners, architects and sociologists these days. A chapter on technological approaches to urban conundrums is titled "Maximum City," an unspecified echo of Suketu Mehta's 2005 book of the same name about Bombay. The phrase takes on new meaning here, as rather than the slums and criminal underworld of India's largest city, Hollis uses it to describe the sparkling new techno-utopian city of Songdo in Korea. He highlights the success of M-Pesa in Kenya. It's a microfinance effort spearheaded by Vodafone, which employs mobile phones as a means to transfer money. In a place where traditional banking is an impossibility for many, M-Pesa gives people an easy, safe way to manage their money and helps stabilize the urban economy. But Hollis reminds us that it is not gadgetry, nor design, that really makes a city. He addresses the Trayvon Martin killing in Sanford, Fla., and the gated community where Martin was shot. Did neighborhood watch volunteer George Zimmerman see his patrols as reinforcement for those gates? The book also notes the growing trend toward surveillance cameras that stand watch over our public spaces. In the end, it is not technology but the people and, especially, trust between them, Hollis suggests, that make a city livable. That's a thought about our urban environs profound enough to keep the mental gears turning for the rest of the summer and far beyond. Franklyn Cater is senior producer at NPR's All Things Considered and editor of the NPR Cities Project.